RANDY BOWSER has decades of experience as a MIDI musician, as well as an actor and director in both professional and community theatre. Composer RUPERT HOLMES gave Bowser special permission to adapt Holmes' "The Mystery Of Edwin Drood" for MIDI keyboards. "Pirates of Penzance" "HAIR" "Metropolis" and "A Funny Thing..." were all produced with Bowser's keyboard adaptations at PENTACLE THEATRE™ in Salem, OR. 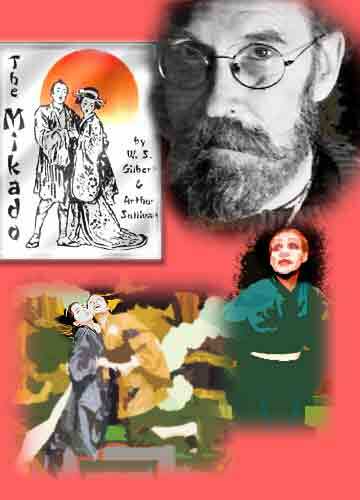 Randy Bowser and images from Pentacle's production of "The Mikado"
Hundreds of hours went in to the production of the lush, complex, but clean MIDI recordings Bowser created for "The Mikado" and "The Pirates of Penzance." THESE SOUND TRACKS WERE USED at Pentacle Theatre™ to great success. Tempos were honed, layers of sound were developed, and the "virtual orchestra" was a glitch-free, seamless foundation for the productions. The piano/vocal scores were the backbone for Bowser's adaptations, and many different recordings of the operas were consulted, including the D'oyle Carte. "Sampled sounds" were combined with a bank of many different kind of synthesizers, to produce a rich, multi-textured sound. 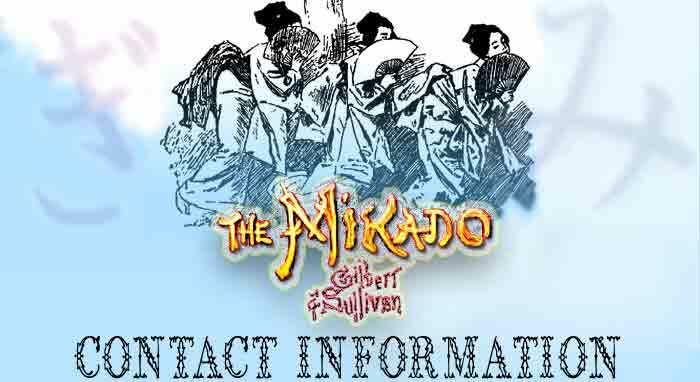 For "The Mikado," Xylophone and Japanese percussion are used sparingly but effectively throughout, and every track has aural surprises for Gilbert and Sullivan experts and novices alike. For "Pirates," the Josep Papp Broadway version was a major inspiration. While the resulting orchestral arrangements are not entirely traditional, they do more than justice to Sullivan's brilliant music. The beautiful string and woodwind lines are intact, played flawlessly, but with warmth. The guiding concept was to adapt the Gilbert and Sullivan scores in a way appealing to modern audiences. These recordings will make it possible for theatres limited in means to produce a thoroughly professional sounding show, for the average cost it would take to hire one musician. If you haven't already, take a listen to the brief sound clips on this site, for a taste of how musical and non-robotic the recordings truly are. There are two options for utilizing the recordings: Straight from the CD, or converted to wav files and triggered from a computer. This latter method is what the sound engineer at Pentacle™ chose to do. COPYRIGHT for the recorded performances is maintained by Randy Bowser, and duplication of the rental CDs would be an infringement of copyright laws. Your rental fee pays for the rights to use the recording for one production of the show, and if the discs are not returned within a month of your show's closing, there will be a purchase fee of an additional $200.